Nycoil - DBH Distributors Inc.
Nycoil is a leading manufacturer of tubing, hoses, fittings, and quick couples. The company is considered a household name in the industry of fluid power and pneumatic markets, and has been running its operations since its establishment in 1958. The company has manufactured many helpful gems over the years and some of them include, ultra-lite superbraid tubing, poly-matic push-to-connect fittings, and self-storing air hose etc. Why should you opt to purchase Nycoil Products? Nycoil prides itself on making products that are easy to install and easy to operate. Their primary objectives remain to design and manufacture products that are lighter and more durable than the rest in the market. It wouldn´t be far-fetched to state that Nycoil offers a huge selection of tube fittings in standard and metric sizes. 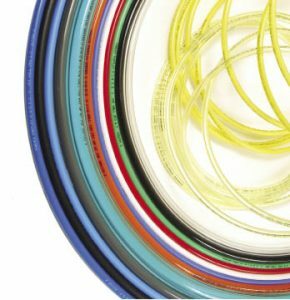 Most of the Nycoil tubing are made of three thermoplastic compounds and they are nylon, polyurethane, and polyethylene. And, most of the thermoplastic tubing products are compact and only feature one-piece fittings. No tools are required in the installation procedure and the set-up process is as easy as whistling dixie. It also helps that the tubing does not require any additional tube support. The Nycoil Blow Gun is also highly rated by the critics and users alike. The Nycoil Blow Gun is available for purchase in various different body styles, giving you many options to choose from. It wouldn´t be an overstatement to state that the Nycoil Blow Gun is the best blow gun that is available for purchase in the market. Where can you purchase Nycoil Products? Since DBH distributors Inc. is a certified Nycoil product dealer, you won´t have to worry about purchasing faulty and defected products. In addition to supplying Nycoil products, DBH distributors Inc. also has the license to supply nationally-known product lines such as Clippard, Monnier, Graco, Parker Brass, SPX Power Team, Reelcraft and many more. Before serving as a product dealer, DBH distributors Inc. served as a wholesale supplier and distributor of components until 2010. However, you should know that their services are not restricted to only dealing with products. The company is also a leading industry expert at providing numerous industrial services including hydraulic pump repair, plant maintenance, CNC millwork, bin stocking, welding, inventory control and fabrication. So, if you are looking for expert advice on the materials you need to ensure that your industrial plant continues operating smoothly, you should head over to DBH distributors Inc. and take full advantage of the experience and knowledge of the DBH team members. Please call us! We would be happy to hear from you and we love to answer any questions you might have about our current products or services; industrial machine servicing; line boring equipment; Pneumatic Valves; Blue Demon Welding Products & Supplies;Steel and Stainless Hydraulic Fittings; Electric Motors and Controls; Carolina Virginia Paint Booths; Air Logic Controls; Hose Reels; Hydraulic Pumps; Pneumatic Compressors; Specialty Welding; CNC Parts, and many more services than we can list.